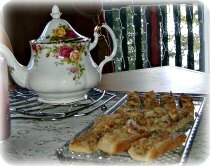 A simple Mennonite Amish bread from the great collections of Mennonite recipes. This bread recipe looks like a 'flatbread' or similar to 'brownies' and is one of many simple bread recipes that's quick to make and bake. We love homemade bread recipes and all recipes from scratch because we know exactly what goes into them for our family of eight. Straight from Mom's kitchen--sweet 'Schnecken rolls' in strips. Spread onto greased or baking paper lined baking sheet 10"x 12"
A quick sweet homemade bread recipe with some great cultural heritage. 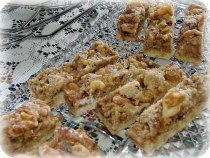 Enjoy this tasty Mennonite foods bread strips snack for any occasion. I have to tell you I just had this Amish bread 'snack' the other day at Oma & Opa's with our whole family and it reminded me of growing up with Sunday afternoon traditional 'Kaffee und Kuchen' or Tea Time biscuits. A homemade cake that's sweet and tasty, a snack your whole family will enjoy just like ours. Enjoy The Baking and... Have An Awesome Day! Oma, you rock..These are great! When can we come for tea again?